Artist - Albert Anker: 1831-1910 Swiss Albert Anker Galleries During his studies, Anker produced a series of works with historical and biblical themes, including paintings of Luther and Calvin. Soon after returning to Ins, though, he turned to what would become his signature theme: the everyday life of people in rural communities. His paintings depict his fellow citizens in an unpretentious and plain manner, without idealising country life, but also without the critical examination of social conditions that can be found in the works of contemporaries such as Daumier, Courbet or Millet. Although Anker did paint occasional scenes with a social significance, such as visits by usurers or charlatans to the village, his affirmative and idealistic Christian world-view did not include an inclination to issue any sort of overt challenge. Also prominent in Anker's work are the more than 30 still lifes he created. 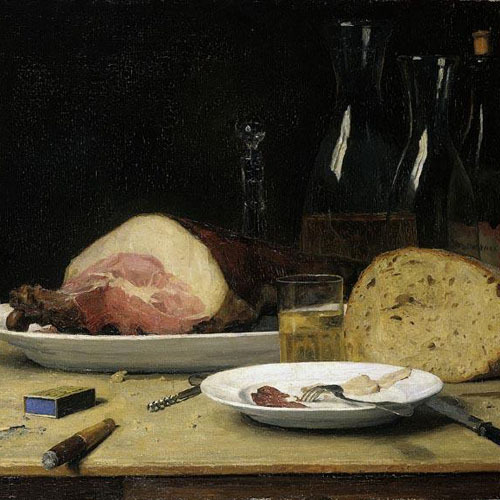 They depict both rural and urban table settings in the tradition of Chardin, their realist solidity reflecting Anker's vision of a harmonic and stable world order. In addition, Anker created hundreds of commissioned watercolours and drawings, mostly portraits and illustrations, including for an edition of Jeremias Gotthelf's collected works. To provide for a steady income, Anker also decorated more than 500 faience plates for the Alsatian producer Theodore Deck. Anker was quick to reach his artistic objectives and never strayed from his chosen path. His works, though, exude a sense of conciliation and understanding as well as a calm trust in Swiss democracy; they are executed with great skill, providing brilliance to everyday scenes through subtle choices in colouring and lighting. Their parochial motives belie the open-mindedness towards contemporary European art and events that Anker's correspondence reflects. This painting is in one inch scale. If you need different size. please email me to see what we can do for you.